For many years at around this time, when I was a columnist on a leading British newspaper, my editor would ask me to write an article predicting what was going to happen in the coming year. I would do my best, trying to work out from the few certainties - election dates, anniversaries and so on - to give an idea what the year might look like. And of course over the following months so many other, wholly unexpected things would happen that my article bore absolutely no resemblance to the real year that was to come. So in the end I gave it up. In our complex, many-centred world, forecasting the future is a mug's game. Who, this time last year, forecast that more-or-less friendly Russia would send its troops into an independent country - Ukraine - and seize an entire section of it - Crimea? Who suggested that the extremists of Islamic State would capture the third biggest city in Iraq, Mosul? And who predicted that by the end of 2014 the oil price would drop to $60 (£40) a barrel, with all that entails for countries right across the world? Plenty of years contain unexpected events along these lines. But one year in particular shows the utter pointlessness of trying to forecast the future: 1989. Although no newspaper and not a single intelligence agency from the CIA to MI6 to the KGB forecast it, by December 1988 the world was standing on the threshold of the greatest change it had seen since World War Two. In 1989 Russia's iron grip over Eastern Europe would simply vanish: Marxism-Leninism was on the point of evaporating. Nowadays we all think it was obvious that this was going to happen. The Soviet Union simply couldn't carry its enormous burdens any longer. We did have some idea of it at the time, of course - but no-one thought the collapse would start so soon. And certainly not in a single evening. When it happened, it was all down to the use of a single word by a tired and flustered politician. Thursday 9 November 1989 seemed like any other day. Those of us who were reporting on German affairs were thoroughly aware that East Germany was starting to liberalise its draconian system, but the process seemed to be completely under control. That evening a big crowd of journalists crammed into an unremarkable hall in East Berlin for a news conference by the main spokesman for the East German government. No-one who fussed about trying to find a seat or a place to stand guessed that within minutes the world most of us had grown up in was about to be convulsed. Shortly after 19:00, Gunther Schabowski came bustling in and sat down in front of the microphones. He was a decent, honourable man, a strong advocate of reform and greater democracy who had helped to get rid of the corrupt characters in the old East German Politburo. He talked for a while about the regime's new approach. Then there was an awkward pause. He had managed to mislay the piece of paper with the government's main decision typed out on it. It took some shuffling of documents and the help of an assistant before he found it. "This will be interesting for you," said Mr Schabowski at last. He was clearly rattled. "Today it was decided to make it possible for all citizens to leave the country through the official border crossing-points. "All citizens of the German Democratic Republic can now be issued with visas for the purposes of travel or visiting relatives in the West. This order is to take effect at once [unverzuglich]." A correspondent from East German radio called out: "What exactly does unverzuglich mean in this context?" Without really thinking, Mr Schabowski said: "Well, it just means straightaway." What the Central Committee had actually decided was that anyone wanting to visit the West could apply for an exit visa. It was intended to be a slow, bureaucratic process, which would be carefully regulated. But Mr Schabowski gave an entirely different impression. 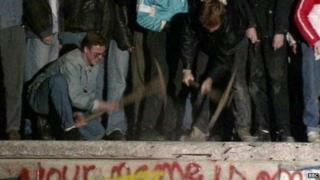 The large number of East Berliners who were watching Mr Schabowski live on television assumed he meant they could just head for the Wall and be allowed through to West Berlin. Straightaway. Those who weren't watching, quickly heard from friends of theirs. Within 15 minutes big crowds were streaming towards the crossing-points. Since the guards at the Wall had no orders to shoot, they let them through. Soon people were clambering up on to the top of the Wall, dancing and laughing and kissing each other. The Wall hadn't literally fallen, it had simply ceased to matter. The world had become a different place. Soon, on balance, it would be safer and richer too. And all because of a single four-syllable German word. I ask you: how could anyone conceivably have forecast that?